For my venison jerky recipes, always select lean cuts of meat. Remove any fat around the edges. Use both front shoulders or flank steak, brisket or round steak. For utmost tenderness, slice very thinly, against the grain and cut into strips, no more than 1/4 inch thick. Marinate for at least 12 hours, the longer the better. After meat has marinated blot dry with paper towels. Do NOT use salt. The first of my venison jerky recipes is outstanding. You will agree after you taste it. You'll never buy store bought again after making this, and you'll also save big time money. You can also make this if you find London broil or flank steaks on sale, grab some and make this deer jerky today. Trim fat from the meat (if there is any) and slice into 4 inch strips. The meat pieces should be between 1/4-1/2 inch thick. It is easier to slice this meat if it is partially frozen. Pound meat lightly and set aside. Combine the rest of the ingredients and mix well. Pour this marinade over the strips of meat. Cover and refrigerate over night. In the morning, line cookie sheets with foil. Place strips of meat on the sheets - do not overlap the meat. PREHEAT oven to 150-175 degrees; or the lowest temperature it has. Bake for 3 hours; turn the meat over and bake for an additional 3 hours. 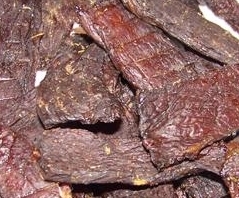 Jerky is cooked when meat is dried out. Enjoy. Place the venison in the freezer and semi-freeze the meat so it’s easily to slice into 1/4 inch strips. Secret: Venison meat cut with the grain will be chewy, and against the grain will be tender. Combine everything together and let sit overnight in the refrigerator. Drain well. If you are using a food dehydrator, just place the pieces on the rack. Do not over lap the pieces; let dry for 24 to 36 hours. PREHEAT oven to 150 degrees and place the venison pieces on a cookie sheet; not overlapping. Bake for 8 to 10 hours, or until the venison bends without breaking. Combine all ingredients, blend well. Add meat, stir at least twice during marinating. If you have a dehydrator, use it. Otherwise preheat the oven to 150 degrees and bake for 8 to 10 hours. You will love this venison jerky recipe. Cut meat in half, lengthwise and slice diagonally crosswise into paper thin strips 1-1/2 to 2 inches wide and 4 inches long. Transfer to shallow pan. Combine marinade ingredients and rub thoroughly into meat. Arrange meat on racks and let dry at cool room temperature overnight (do not refrigerate). Preheat oven to 250 degrees. Line two large baking sheets with foil and set wire racks on top of each baking sheet. Arrange meat on racks in single layer. Bake 30 minutes. Reduce heat to 175 degrees and continue drying meat another 40 minutes. Meat should be lightly brown but not burnt. Let meat continue to dry on racks at cool room temperature overnight before packing into jars. Dried meat can be brushed lightly with sesame oil for additional flavor and shine. Makes about 36 pieces.